Now that you know all about the different types of knits. Let’s learn a little about adding the finishing details and a little extra punch to your knit sewing projects. 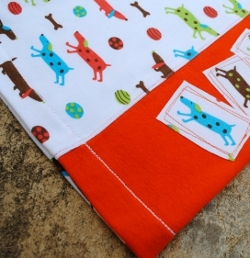 Because knits don’t fray like wovens, appliqueing with them is really easy! Here are the few things that you need to get started: a fabric that you’d like to applique, a fabric cut to applique on and a lightweight iron-on adhesive product like HeatnBond Lite (you want one that says it’s “sewable”). 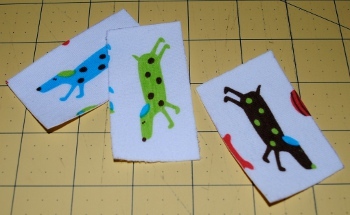 Begin by using a washable marker to outline the sections that you’d like to cut out of your applique fabric. 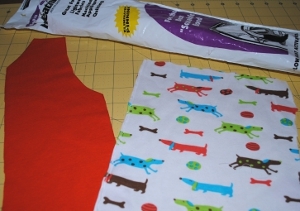 Trim down your applique fabric so you have just a little extra left outside of the actual applique outlines, and cut out a piece of iron-on adhesive the same size as the applique fabric you have left. 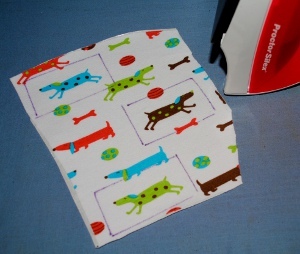 Iron the applique fabric to the iron-on adhesive. Peal the backing off of the iron-on adhesive. 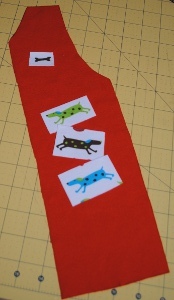 Decide on the position of your appliques keeping the seam allowances in mind. 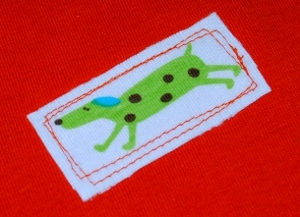 (This is the side panel from the vertical colorblocked Charlie Tee, so it has a 1/2″ seam allowance.) You’ll see here that I decided after laying them out that I needed an additional smaller applique at the top to balance things out. Now just stitch around the applique. 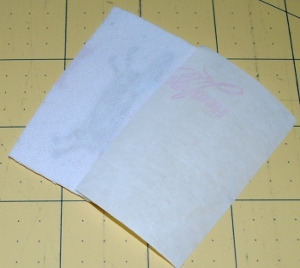 I generally keep my stitching about 1/8″ to 1/4″ from the edge. I intentionally did these a little messy, and I love the look! Add a few more, if you’d like. Now wasn’t that easy? I’m covering hemming last, but when I sew knits, I always hem first. I’ve found that hemming when you have a flat piece of fabric cuts down tremendously on the amount of puckering that you’ll have in your finished project. I covered hemming on my blog a while back. 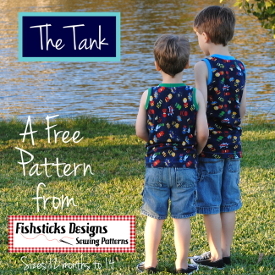 You’ll find my original post here: Hemming Knits Part 1. All of those tips are still great and work really well. I have, however, personally changed my hemming method a little. The way I was hemming then worked great for my guys until they got a bit bigger and started stretching and pulling on their clothes. Then, even with the stretchy nylon thread in the bobbin, our hems were breaking. I was sharing my frustration over this with my friend, Michelle, one day, and she asked me if I used the triple-stretch stitch on my machine. Hmmmm. . . I’d never even heard of that! See–I told you I’m still learning new things along the way. Now, though, thanks to Michelle, I have a method of hemming that never fails! It takes a few extra minutes, but I think it’s worth the extra effort to have a finished product that not only will last for one season, but that I can pass down from child to child. If your knit fabric is really stretchy or if it’s rolling on you, use a little spray starch before you press. Now, when I sew with knits, I always (ALWAYS!) have a stretchy nylon serger thread in my bobbin. (I’ve used Wooly Nylon in the past. Now I’m using Maxilock Stretch.) When I start my hem, I like to sew on the inside. 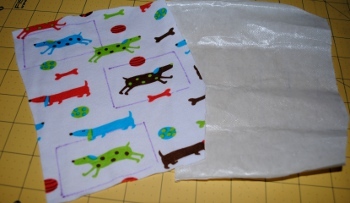 If you only have white stretchy nylon serger thread, then you’ll have to sew on the right side if your fabric isn’t white, though. In this case, I’m sewing on the inside for the first step: straight across the top of the hem using a regular straight stitch. I left the orange thread from the applique above as the top thread so you could see that I sewed this step on the inside. Then I flip my fabric piece over and switch to the triple stretch stitch, and sew again on the front side of the fabric right on top of the original stitching. All done! A hem that won’t disappoint you! When I wrote the above information about hemming knits, I was looking for a great way to hem that wouldn’t come undone. The preferred way to hem knits is with a twin needle. 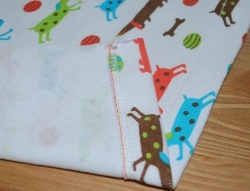 It gives a nice side-by-side double stitch on the front with a zig-zag on the back which allows the fabric to stretch without the stitches popping. At the time, I’d been unable to master using a twin needle which, frankly, given that I have a business built on sewing with knits, was a bit embarrassing. Not too long after this Knit Knowledge Series wrapped up, I got determined to figure out this twin needle thing once and for all. 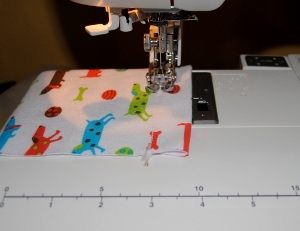 I sat down at the machine, pulled out my twin needle and grabbed the manual for my machine. I skimmed over the instructions as I’ve done in the past, but something new caught my eye. And guess what happened? I pressed that little key, installed the twin needle, threaded everything up, and I’ve stitched all my hems beautifully with a twin needle since. I suppose that’s a good lesson in reading the instructions . . . and if it still doesn’t work after you’ve read the instructions, maybe you should read them again. Thanks for all the great info this week. Your tips for hemming are sure to come in handy. Now I just need to find some wooly nylon and I can get started! 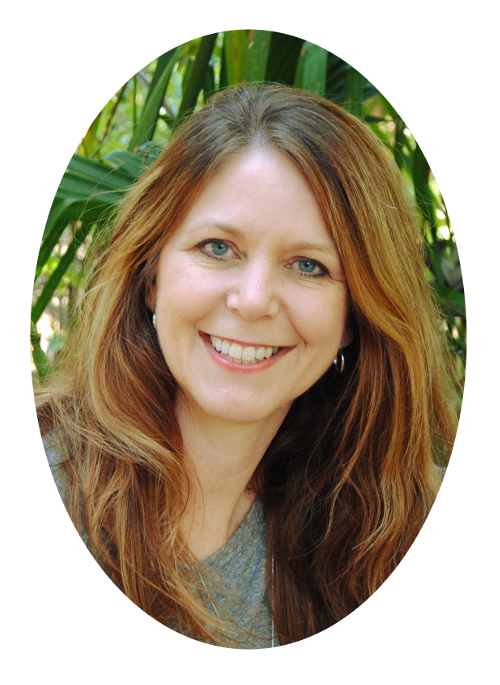 Great posts this week, Bonnie! I love the triple stretch stitch for hems, I use it when I’m too lazy to get out my twin needles. I also sew all my high-stress seams with the stretch stitch (looks like a lightening bolt) since it hold up much better than just serging for us. Do you use the triple stitch for the top stitch on the neckline too? 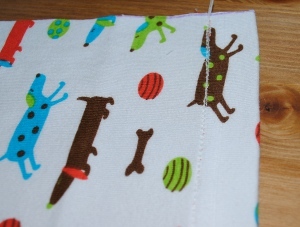 Oh, and what seams can/should be sew with a coverstitch machine, if a person has one? You have given out some great information. Thank you for sharing your knowledge ;-). I really like your spray starch trick! Thank you for all the interesting tips! I really like the tip on hemming the knits using the triple straight stitch. Didn’t know that sewing with a straight stitch first would help out so much more. Will try that next time. I need to go look at my machine for a triple stretch stitch. Hemming is my least favorite sewing thing, but the starch definately helps. Thanks for the info, Bonnie! 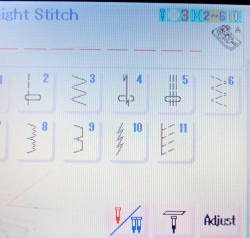 I have to see if my machine has that triple stitch in my cams selection. I have a really old machine. Thank you for doing this series! I enjoyed reading it! What a great tip for hemming! Thank for this Knit Knowledge. Thanks for these tips!! 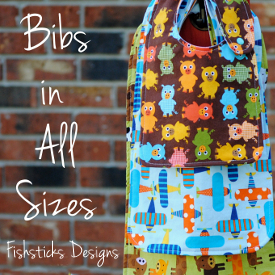 I have used the triple stitch for stretch fabrics before, but you’re right, it usually pulls and puckers. I will have to try straight sewing first! 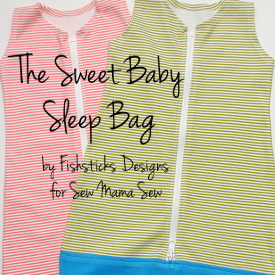 Do you find that the straight stitch pops after a time? 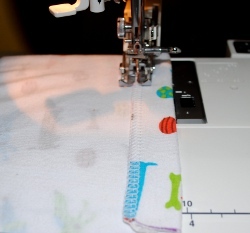 When you put a stretchy nylon thread in your bobbin, do you wind the bobbin on the machine or by hand? Does it change your thread tension? I’ve tried it in the past from your previous hemming blog post and I had a horrible time getting the tension right but I did wind the bobbin on the machine. Lately, I’ve been using the stretch stitch on my machine or even a three step zig zag in a contrasting thread. Great tutorials!! I am hoping others find the joy of sewing knits. Love the shirt!! Fun tute, Bonnie! I like your hemming technique. I learned about the triple stretch stitch. I am also going to buy some spray starch for the next time I sew with knits. Neat! I never thought of using that stitch. It only needs one needle, right? Not a twin needle? I never knew about the triple stitch on my machine. Well, I always saw it there, but I never really knew what to do with it… And because of this post, I’m going to buy some spray starch next time I’m at the store. Hopefully I’ll loose less hair with it (because I won’t be pulling it out in frustration). Ooh, good tip about sewing it down first and THEN going back over with the triple stitch! My question is how to get the hems lined up nicely when you hem them before you sew the side seams together? No matter how much I measure and try to get my hems the same size, the stitching just does NOT match up at the seams. You make it look so easy! I have found sewing knits to be much easier now that I finally got a walking foot! I didn’t realize that I should attach appliques to an adhesive first, but that would make things a lot easier! Thanks for the instructions! I recently learned about the triple stitch on my machine too. This week I learned a lot about the different types of knits. Thanks for such a fun week. I feel a little more comfortable with knits now. I don’t have a serger; do you recommend a twin needle for hemming knits, or do you have any other neat tricks that would work? 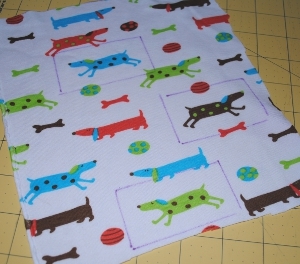 For hemming do you think a coverstitch is sturdy enough? Thanks for teaching me something new!!! I had always broken out the double needle for good hemming but am thrilled to have one less set up step and am eager to try out the triple stitch! Thanks for a great week of posts! 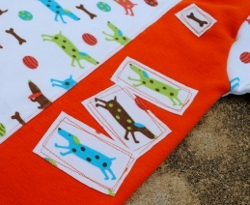 Love the how to applique with knits tips and the triple stitch tip!! 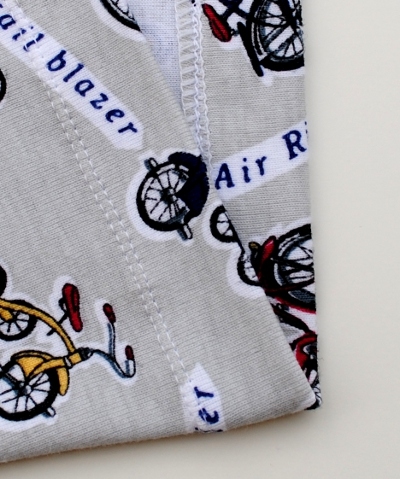 My question is: How can I stop serged seams from popping like under the armpits, when the kids put their clothes on less carefully than I would like them to? I can’t stand to mend things and I’ve had some waiting for ages because it’s my least favorite task! Love the applique. I get lazy about doing those touches but they really set the shirt apart. Love the shirt!!! We have a miniature dachshund!! 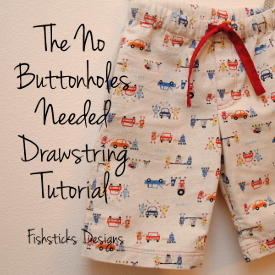 Thanks for sharing more info on sewing with knits. 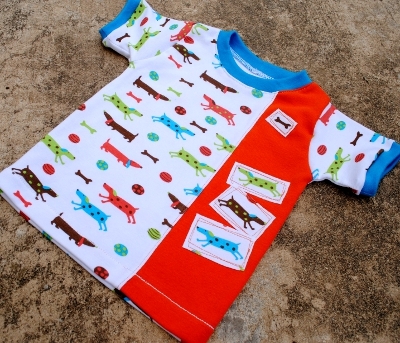 I am waiting to get some knit fabric for neckbands and such than I can try making my first ever shirt (or baby outfit as I’m expecting in August). I hadn’t heard of the triple stitch either! I’ll have to see if my machine has that. I know that I have “stretch” stitches. I have never tried your starch trick, but have made SO many tees! I should try it next time I do it to see if it does better. 🙂 Thanks for such a great tutorial! This is probably a silly question but where do you buy stretchy nylon serger thread? Regular sewing store like JoAnn’s, specialty store, or online? I love the applique tip. I am new to sewing with knits, your info has been helpful. Thanks! Thanks for the tip, I never knew what that stitch was for! Do you have a Janome 10000? I just bought a used one and the screen looks very similar to mine, I will try these tips when I brave sewing knits with it for the first time!! !